Optimize your water saving plan! The summertime tends to lead to a lot of water usage. However, rather than accept a high water bill, you can take a different approach. With the tips in this blog, you can lower your monthly water bill and help to keep your water usage down, which benefits the community. Are you interested in learning more? Let’s take a look. Handwashing dishes? Let the dishwasher handle it. Believe it or not, using the dishwasher is actually more beneficial to your water bill than washing them by hand. If you want to make the absolute most of this tip, then you should scrape your dishes rather than prerinsing and only run the dishwasher when it is completely full. 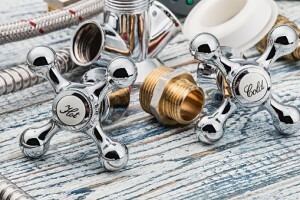 Leaky faucets and pipes can lead to a lot of extra water usage. If you want to save more water, then you need to make sure that your plumbing system is working efficiently and effectively. If you’re not sure about whether or not it is running at optimal levels, then we can take a look for you! Save water by insulating your hot water pipes. Yes, this is still a summer water saving tip and here’s why: How much time do you spend waiting for your shower to get hot enough to step into? How long do you run the tap while waiting for hot water? It’s probably only a few seconds, but when you add that up over the course of the week, then it becomes several minutes. After that it becomes days and then weeks. When you insulate your hot water pipes, you will be able to get hotter water faster. Thus, you will be cutting down on the time it takes for it to heat up and you will waste a lot less water. Need help with the installation? That’s what we’re here for! Save money with these water saving tips! Need to find and solve a leak in your water line? Give Master Plumbing & Mechanical a call at 301-650-9100 and let our experienced plumbers get the job done right. This entry was posted on Friday, June 24th, 2016 at 8:14 pm. Both comments and pings are currently closed.